DUSTIN WRIGHT: This is Dustin Wright, and I’m the founder of Disability Cocoon, and this is your Assistive Technology Update. JOSH ANDERSON: Hello and welcome to your Assistive Technology Update, a weekly dose of information that keeps you up-to-date on the latest developments in the field of technology designed to assist individuals with disabilities and special needs. I’m your host, Josh Anderson, with the INDATA Project at Easter Seals Crossroads in beautiful Indianapolis, Indiana. 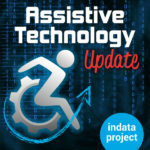 Welcome to episode 409 of Assistive Technology Update. It’s scheduled to be released on March 29, 2019. I’m sure that you are probably still worn out from partying on Wednesday for AT awareness day, still very happy that Congress passed that so we have our own AT assistive technology awareness day here in the United States. On today’s show can we have Dustin Wright, founder of Disability Cocoon; some quick stories about a surrogate body robot; artificial intelligence being used by Google to help individuals who are blind or visually impaired; and some reasons to maybe not put your whole life on Facebook if you are trying to get Social Security disability benefits. We also have Amy Fuchs from BridgingApps to talk about an App Worth Mentioning. Let’s get on with the show. Are you interested in spending a day learning more about web accessibility? Join us for our web accessibility for developers 2019 webinar where you can join renowned web accessibility professional Dennis Lembry for a full day of training. This webinar of training begins with a background on disability, guidelines and the law. The many techniques for designing and developing an accessible website are explained. Basic through advanced levels are going to be covered. The main topics include content structure, images, forms, tables, CSS, and ARIA. Techniques on writing for accessibility and testing for accessibility will also be covered. If you are involved in web design or development can you don’t want to miss this wealth of practical knowledge. This is a completely free webinar, but you do have to register for it online. The webinar will take place on May 8, 2019 from 11 AM to 4 PM. For more information or to register, go to EasterSealsTech.com/A11Y. We will go ahead and put a link to that in our show notes. Many of you have probably heard – and the news has shown us lately – that you have to be careful what you put out there online. Something that you do today might show up years from now to really come back and bite you. I found an interesting interview at WDEF.com, a CBS news affiliate. It’s titled, “Facebook, Instagram posts could affect your Social Security disability claim.” It goes on to talk about the Social Security Administration may start screening Facebook and Instagram posts to evaluate disability claims. Currently, the federal agency uses social media to investigate fraud cases, but it’s planning to expand that usage. It kind of says, most people really don’t put their real life on Facebook. Just pictures of your food and your kids and little things like that doesn’t really show who you are and maybe the challenges you’re going through. It’s something that may or may not go through. There is always a lot of data privacy questions out there, but I guess it also raises the question that if you were putting it out there where anyone can see it, can you really not expect these kinds of agencies to look at it? Where you stand on that, I do know that a lot of folks here in the United States rely on Social Security and disability benefits and order to be able to survive. Kind of be careful with what you put online, because it looks like Big Brother might be watching it more than we think. I found a super interesting story over at ECNmag.com, and we will put a link to the over in the show notes. It’s a story out of the Georgia Institute of Technology called, “Seeing through a robot’s eyes helps those with profound motor impairments.” The story is about a robot created called PR2. PR2 is controlled by a web interface. A user can control the entire thing through a web interface using the technologies they already use, such as an eye tracker, head tracker, head mouse, switch system. Whatever they are using to control their computer, they can login and use this to control the robot. They actually call it a robotic body surrogate, which I think is very cool. This robot can actually perform tasks similar to those that humans would do. If you think of maybe bathing or – I don’t know, it even mentions scratching an itch or being able to feed oneself, just by using a head mouse, eye tracking, these kinds of things, you can use this interface and make this robot do these things for you. It talks about the two different tests it’s gone through and having folks use it. It has two arms, a head, gives it the ability to manipulate objects such as water bottles, washcloths, hairbrushes, even an electric shaver. Even talks about in the second trial, the individual they gave it to use it for a week, and he started having a do even more than they thought by moving both arms independently, having it due to tasks at a time. It does say this is nowhere close to being commercially available yet, just because of the price and the size of the device, it just wouldn’t really be feasible to do it. But it’s cool that they’ve made this, and it’s very cool that it is in testing. Hopefully it’s something that will come down the pipeline later on. I know that sometimes most of the folks I worked with, a lot of personal care assistants, folks that do that work, I’m not going to say it’s a thankless job, but it takes a certain kind of person to be able to do that job really well. Unfortunately, those people aren’t always easy to find. May be something that could take a little bit of the burden off or even help an individual to be a little bit more independent with some of these things so they could do some more stuff for themselves with the help of technology. Of course, they will probably still need a worker or a real human to be able to help them out with some things, but this could really be some great assistive technology. We talk a lot about robots, AI, and all these other cool things that are really working their way into the assistive technology market, but this is a very neat thing that could really provide a significant benefit to folks with severe motor impairments. We will put a link to the story in our show notes. Moving on from robot and straight into artificial intelligence, it looks like Google now has their own assistive technology that’s going to help individuals who are blind or visually impaired. Much like seeing AI, made by Microsoft and available on iOS devices and coming soon, I believe, to Android devices, Google has one called Lookout. Lookout right now is only available on the Pixel. If you have a Google pixel phone – and it doesn’t say which version so I’m guessing all of them. What it does is it does a lot of the same things as seeing AI, but this is kind of Google’s version of it. It says it has similar underlying technology as Google Lens, and it says it’s able to help you learn new spaces for the first time, read text in documents, complete daily routines such as cooking, cleaning, and shopping. It says you can actually hold or where your device, like on a lanyard or a shirt pocket. It’ll tell you about people, text, objects, and much more as you move through space. It also says once you’ve opened the app, all you have to do is keep your phone pointed forward. You don’t have to type anything or access it at all, really it could just sit there and tell you what’s going on in the world around you as you walk. As I said, it’s only available on the Google pixel phone right now, but they are hoping to get it to different devices and platforms soon. It’s also only available in English in the US right now. Kind of a slow rollout cup of very cool. Hopefully that AI will be able to learn more and then they can go ahead and get that out in other countries for other devices and be able to help out some more people. I’ll put a link over to that story in our show notes as well. AMY FUCHS: This is Amy Fuchs with BridgingApps, and this is an App Worth Mentioning. This week’s featured app is called Caren RPM. Caren RPM is a voice interactive app that enables users to input important health data simply by speaking. Updating a measurement is as easy as saying it. You can touch the microphone icon and say your blood pressure, pulse, glucose, pain level, and temperature, as well as any comments you want to include. For blood pressure, you can also specify whether a blood pressure measurement was taken while sitting, standing, or lying down, which is very important for doctors to know. Caren RPM let’s providers monitor you and your loved one between clinic visits by providing a efficient way to view and analyze your health information. Healthcare providers can view patient generated health data for multiple patients and touch any reading to view logs and statistics. When a provider views information, a green check mark appears in the patient’s logs to indicate that the provider side. This provides peace of mind by showing that doctors have used data and allows users to add followers to the patient’s village. Newly updated, Caren has added a feature that lets caregivers share GPS coordinates and medical information of patients with emergency management agencies and with physicians at emergency shelters. Caren RPM is designed to be simple to use, keeping in mind all kinds of users, including those with low dexterity, low computer literacy, as well as physical and mental challenges. Caren RPM is available for free at the iTunes Store and Google Play Store and is compatible with iOS and Android devices. For more information on this app and others like it, visit BridgingApps.org. JOSH ANDERSON: Listeners, I’m really excited to be presenting next week at the Tech Fest here in Indianapolis, Indiana. This day of learning and interaction is going to be put on by an organization called Disability Cocoon. The founder of Disability Cocoon, Dustin Wright, is on the show today to tell us a little bit about the organization, about these Tech Fests, and about himself so we can find out more. Welcome to the show. DUSTIN WRIGHT: Thanks, Josh, glad to be here. JOSH ANDERSON: Thanks again. I know you are busy, especially putting these on. I can’t wait to talk about them. Before we get started, just tell our listeners a little bit about yourself and your background. DUSTIN WRIGHT: I very proudly started in this field working as a direct support professional for a provider agency here in Indiana, loved it, didn’t really know what I was getting myself into when I answered an employment ad in the paper. I got there, and after doing that for a few years, kind of fell in love with the field. I was doing that while I was going to Purdue University. After graduation, I ended up doing the Q Roll [phonetic] and was the director for the agency for a while. Kind of have my roots in direct care and working for provider agencies. I was lucky enough in 2006 to be one of the founders of Rest Assured, which is a remote support company based out of Indiana that has been providing remote support around the United States. That’s the background that led me to starting Disability Cocoon. JOSH ANDERSON: Before we talk about Disability Cocoon and what it is, where did the idea come from? I know you said that led you up to it, but where did the idea start? DUSTIN WRIGHT: It kind of was the battles that I was facing on an everyday basis as executive director of Rest Assured. Trying to launch a new form of support in the disability industry was challenging – not to say that the industry is too slow to change, but they were cautious for the right reasons. People are slow to change, so I saw that there was this huge learning curve that had to happen before people would adopt any new type of technology or any new innovation in this field. Going out and meeting with those state Medicaid agencies and first getting funding in place and waiver changes. Once you get that done, you have the educational time period where people just need to see the technology in action and be able to experience it for themselves and see some real success stories. All that takes a long time. I was sitting at my desk one day at rest assured and out, it would be great if there was somebody out there that was pulling all the tech stuff together around the country. You guys do a great job, and the other assistive technology act programs do a great job, but I am felt like there was this new form of technology, remote supports being one of those, that I could really help push forward and wanted to form a resource that could help companies that were developing technology to give them a way to get out and meet the people in this field, the person served, as well as the agencies and professionals who were supporting them, but also to just create a resource for people to go to with the goal of shortening that education window and making the education for people a little bit easier. JOSH ANDERSON: I know you do that kind of – I’m going to call it outreach, but that kind of outreach and education and some different ways. I mentioned at the beginning that myself and Brian Norton here are going to be presenting at the Tech Fest in Indianapolis. Tell us about these Tech Fests. DUSTIN WRIGHT: I’m glad you guys are excited to do that. The Tech Fests aren’t one-day conferences – I called them Tech Fests because I do try to have it different feel than a typical conference environment where it’s a more laid-back, making the technology feel approachable in a comfortable setting. Basically what I’m doing is I’m bringing in people, companies that have different types of technology solutions that support people with disabilities, but also companies that have technology solutions support agencies or other professionals that are providing. We are family members who are providing supports to people with disabilities. I’m bringing in all these different vendors from across the country, speakers. I tried to not do typical conference environments where I have speakers up on stage all day and people sitting in the audience. I really try to get some interaction going and people putting their hands on things and doing some lab and building some things themselves and product demos, just to create a playful, fun way to learn about everything in disability technology. JOSH ANDERSON: I think that’s great. I know that something that we all run into at conferences. No matter who is presenting, they are always talking a little below someone’s level or way above someone’s level that’s in the audience. Being able to get your hands on it and be able to see can help you with understanding how these new things can help folks. I know that this one coming up in Indianapolis – and I’m sorry, I keep talking about that. It’s just close and local. That’s not would be your first event. How many of these events have you had so for? DUSTIN WRIGHT: Indianapolis will be our third in about a six month period. I launched Disability Cocoon – the legal entity was formed in July, we held our first tech fest in Cincinnati in October, we did Columbus, Ohio, in March, and we are doing Indianapolis in April. We have one in Chicago in June of this year, probably planning one out in Denver, the bold area in October on the heels of the Coleman Institute conference. We will probably be doing one down in Wichita. Trying to do them more regionally across the United States because I feel like national events are great, but I feel like for these really have the most impact, they have to be regional in nature so we can bring in not only the national resources, but kind of tight and some of those local resources which are also actually critical in helping people accomplish the goals. Trying to keep them regional. JOSH ANDERSON: Keeping them regional is nice because conferences are expensive, once you figure in hotel and rental cars and all those things. If it’s within driving distance, that definitely brings the cost down. You can bring more folks can learn more. JOSH ANDERSON: You don’t just do this from these tech fests. You also do web events, webinars, those kinds of things. What are some of those like? DUSTIN WRIGHT: We call them tech huddles, which they are, just webinars basically. They are basically many tech fests, if you will. I’m bringing in a lot of those same speakers that I would have at the tech festivals, and we are doing online demos. Very similar to a podcast, but I have the people actually showing and demonstrating and talking about whatever form of technology that they offer. I try to give them “non-salesy” but it is typically accompanied talking about a solution that they are providing. They are very interactive, so people can see the presenter, they can interact with the presenter live through a chat. We do record those as well. We are just now hiring an editor who will be pulling those together and putting them on YouTube as a resource so that people can learn these things. If they are not able to get to the tech festivals, this is a way that they can learn either live once a week through the webinar or they can go watch a recorded version of that on YouTube. JOSH ANDERSON: I know there’s a lot of different kinds of tech huddles, different kinds of tech fests. Who would these before? Is it more for lawmakers, providers, parents of folks with disabilities, or everyone? Can you talk about that a little bit? DUSTIN WRIGHT: It really is all across the board. It’s something I’ve been thinking about a lot lately, is who do I need to be creating this content for. Right now it is policymakers at the state and national level so they have a place to learn this stuff, maybe share resources from state to state, for the provider community or other professionals, for case managers, but also for family members and for the person themselves, the self advocate, so that they can have a place to learn and see what is out there that could benefit them. That’s kind of the scope right now. I feel like at some point, I may have to narrow the scope little bit. But I guess right now, trying to figure out exactly where we would have the most impact and do the most good. JOSH ANDERSON: I know as some states are starting their tech first initiatives and things like that, this is definitely a good resource for them to send folks to, to get a hands-on. I know even when I talk to folks, and do presentations at different places, different providers, and folks at all different levels, almost everyone at one point is like, I never knew that could do that. I never knew that existed. Not only can this help the people I provide services for, but also that help my cousin, helped my mom, helped my son. Wow, it’s free or is low cost or its these things. Very cool that you guys are getting the word out to all the folks that can use and benefit from. DUSTIN WRIGHT: The other piece of this that I’m really trying to do is to create a community around this. As you said, so that people can hear from someone else that maybe experience it in a tech fest or a huddle or social post, and they can share it. They got an email and they can forward it along. Just creating a place for people to come and start a conversation around this and start sharing resources, I guess is the main goal. JOSH ANDERSON: I’m sure that everyone who has presented at one or has done one is like me and gets a lot of questions. Hey, you presented on this. Do you know anything about this? It’s great if you have some place to send them. In this whole world – and you know because you’ve worked in it for a while at — you know a little bit about everything but not much about anything, it seems like. It’s hard to keep all that – and it’s technology, brand-new everything the day. Speaking of brand-new, what does the future hold for Disability Cocoon? DUSTIN WRIGHT: Right now I’m just trying to continue to build the momentum that I have right now, that we started. One of the big problems I’m saying is that a lot of the tech vendors that are out there are getting so many requests to go out and do in person events and education and training that it’s just tough for them to be in a thousand places at once. I’m looking at bringing the conferences online and doing them 100 percent online so that people can – one, it’s going to reduce that travel cost to get the information into people’s hands. If we are talking about using technology to support people, you might as will be using technology to educate people. I’m looking at maybe going that direction. Also looking at designing some training for case managers, provider entities that are looking at how to incorporate technology into their agency from that perspective. Maybe possibly looking at certification programs for some of the technology vendors that we are seeing. Each state is requiring different training, different background checks, based upon their state Medicaid rules and licensure requirements. That’s going to be very challenging and will, I think, be a barrier for new innovation and new technology to spread across state lines as vendors are slow to move across state lines and have to comply with new policies and procedures as they move across state lines. I feel like there is an opportunity to help those folks standardize what the industry looks like. I’m not sure about going be possible or not, but it’s something else I’ve kicked around. JOSH ANDERSON: I think it’s a great idea. I love how you started talking about how you started off in remote support and I talk about remote tech fests. That’s a good full circle. I think that would also help out, because it opens up your accessibility a lot for folks. I know we tried to make everything as accessible as possible, but at the same time, it’s pretty difficult for some folks to get there and see everything. It would be nice if they could access that all from the computer or anywhere they wanted to. Dustin, you’ve been doing this for a little while. I know you said you just started everything last year. Let’s say you had a time machine, you could go back and tell Dustin back then something. Is there anything you would change, do differently, or what have you learned in the short time that Disability Cocoon has been around? DUSTIN WRIGHT: I think that the biggest lesson I learned is conference planning is no small thing. I first thought I could just get some speakers, have some exhibitors come in, not a big deal. Just like with anything, the devil is in the details. That’s one thing I would have given myself warning on. Besides that, I feel blessed. I feel like things have been moving very well for disability cocoon. There seems to be a lot of interest for what we are doing out there. I’m super excited about it. I guess that would be my big thing. JOSH ANDERSON: It that’s all there is, that’s definitely a good thing. If our listeners want to find out more about you come more about disability cocoon, how would he do that? DUSTIN WRIGHT: The main place to I would recommend is starting at DisabilityCocoon.com, Cocoon is C-O-C-O-O-N. That would be the one place to go where you can see everything that we are doing and get plug-in to all the resources we have. We are also trying to establish a presence on social media because what better place to share information and that’s our goal then through social media. We are on Facebook, Twitter, just getting started with Instagram. If you just look for disability cocoon. Also YouTube, where you can go watch those past recorded tech huddles. If you just had the website, DisabilityCocoon.com, there will be links to all those resources. JOSH ANDERSON: Excellent. I’m looking forward to seeing you next week at tech fests here in Indianapolis, Indiana. Thank you for coming on the show. Our guest today was Dustin Wright, the founder of Disability Cocoon, and maybe we will have you on sometime in the future and see if you learn anything else or see where everything is going. DUSTIN WRIGHT: Thanks. I really appreciate it. JOSH ANDERSON: Do you have a question about assistive technology? Do you have a suggestion for someone we should interview on Assistive Technology Update? If you do, call our listener line at 317-721-7124, shoot us a note on Twitter @INDATAProject, or check us out on Facebook. Are you looking for a transcript or show notes? Head on over to our website at www.EasterSealsTech.com. Assistive Technology Update is a proud member of the Accessibility Channel. For more shows like this, plus so much more, head over to AccessibilityChannel.com. The views expressed by our guests are not necessarily that of this host or the INDATA Project. This is been your Assistive Technology Update. I’m Josh Anderson with the INDATA Project at Easter Seals Crossroads in Indianapolis, Indiana. Thank you so much for listening and we will see you next time.